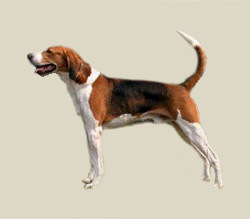 While similar to its English cousin, the American Foxhound has been developed by its breeders to be lighter and taller, to have a keener sense of smell, and to be even faster in the chase. A large, handsome hound, its front legs are long and very straight-boned. The head is long with a slightly domed, large skull. The ears are broad and pendant, framing the face. The eyes are large and wide-set - either brown or hazel, with a sweet, imploring expression. The ears are wide, flat to the head and its tail is carried cheerfully with a slight upward curve, like a sickle. The short, hard coat may be any color. Although by tradition the foxhound is not a house pet, it is actually well-mannered in the home. It gets along best with human or canine companionship. It is a tolerant, amiable and gentle dog, even though it is not very demonstrative. Most are reserved with strangers. It is first and foremost a hunter, ever ready to hit the trail. It needs daily exercise in a safe area. Once on a scent, it will follow gleefully, heedless of commands. This is a dog that likes the outdoors; it is not a city dog. It bays. The foxhound needs daily exercise, preferably in the form of a long walk or jog. If allowed to run off leash, it should only do so in a safe, enclosed area. Foxhounds traditionally live outside, although only with warm shelter and bedding and in temperate climates. They are highly sociable, however, and should never be expected to live alone. The coat is easily maintained, requiring only occasional brushing to remove dead hair.